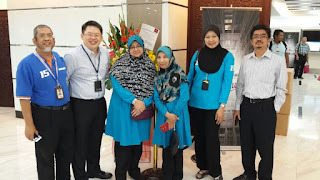 One of my biggest achievement is to have been entrusted to lead Bank Muamalat Malaysia Core System replacement project. In fact, I was responsible even for the tender response and was involved in the commercial negotiation. My CV was submitted in the tender response as project director should Silverlake win the project. When Bank Muamalat finally awarded the job to Silverlake in early December 2012, my duty as the captain of Silverlake team officially began. The project was officially kicked off on the 13th December 2012. I was lucky to have worked well with another colleague that took care the relationship part. In order to speed up the process, Silverlake and Bank Muamalat agreed to have signing ceremony and project kick off on the same day. The core bank system replacement "codenamed" as Muamalat Banking System or MBS was very important for bank muamalat. Most of the board members attended the official kick off. High tea with some of Bank Muamalat top management and board members. The project was successfully completed 16 months later. Bank Muamalat officially cutover the new Silverlake Integrated Islamic Banking System (SIIBS) on the 16th June 2014. Congratulations, look forward to read more about the Islamic Banking. Keep up the good content Sir.